I love pasta with seafood. 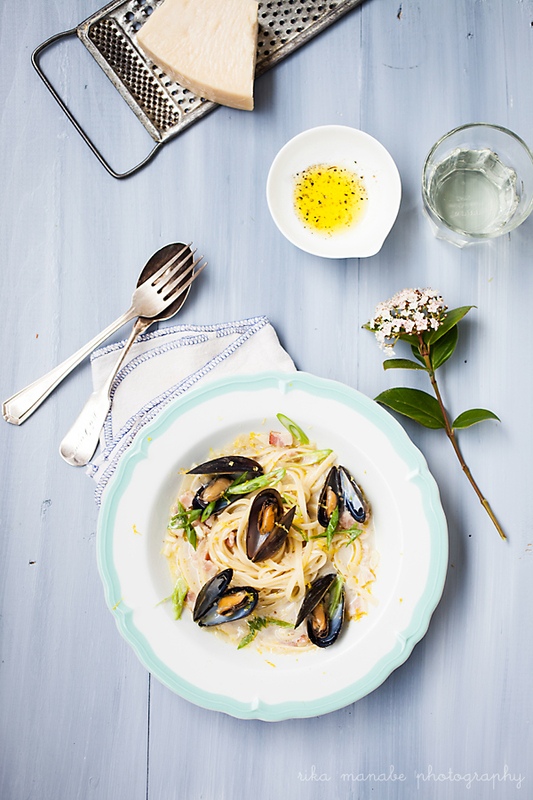 If I see linguine ai frutti di mare on the menu at an Italian restaurant, I order it almost every time. I don't often buy mussels even though I love them. They are one of those things that I love but don't crave for on a day to day basis. Today, though, I saw them at the neighborhood market and they looked so fresh and tasty that I felt I could hear them screaming at me to take them home. So I did! This dish is fairly simple and quick to make. 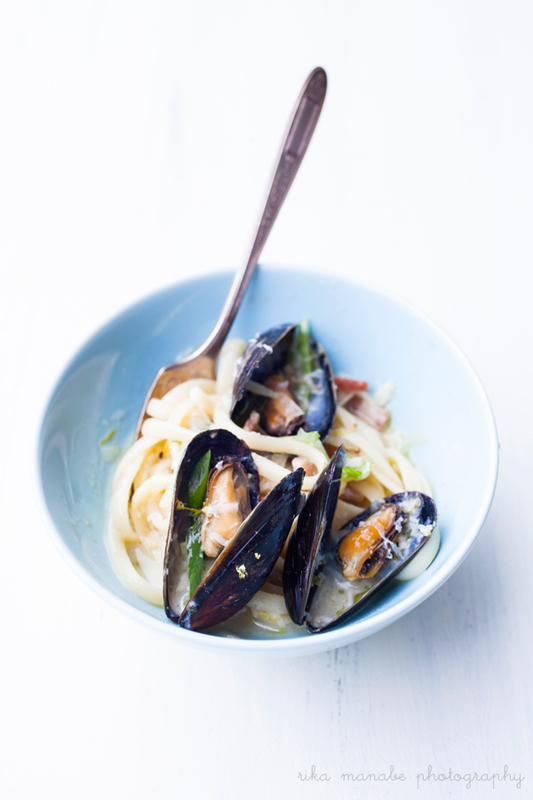 The most important thing is good fresh mussels; if you have them, you are good to go. If you want to treat someone to something special but don't have a ton of time to cook, I recommend this! 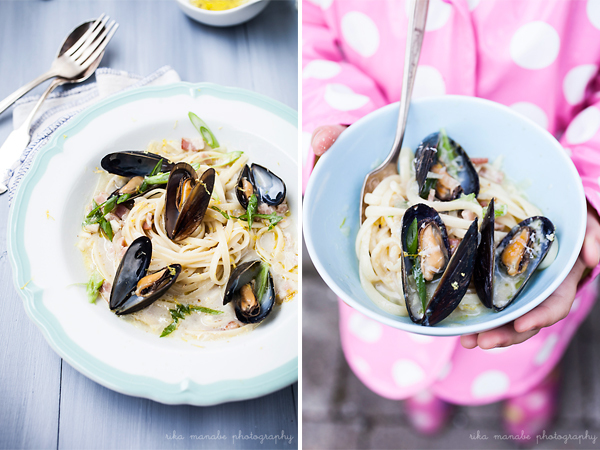 I also made another dish with mussels that my mom makes all the time, which will be posted next! Fill a large deep pan with plenty of water. Bring the water to boil with a table spoon of salt on high heat. After it boils, lower to medium high heat, drop in a handful of dried linguini and stir to make sure that they are not sticking together. Cook for about 10 minutes. Stir a couple of times while it is cooking. While the pasta is cooking, finely dice shallots and garlic. Cut pancetta or bacon into small pieces. Heat up a frying pan with 2 table spoons of olive oil and satay garlic, shallots and pancetta on medium high heat until they are cooked for about 3-5 minutes. Add rinsed mussels and a cup of white wine. Put a pinch of salt, pepper and oregano in and simmer for a few minutes with the lid on. Drain the pasta in a colander, but make sure to save about a cup of pasta water. Add linguini to the frying pan and pour in pasta water as needed to get a nice broth. Add juice of half a lemon. Adjust the taste with salt and pepper. Sprinkle some chopped green onions, lemon zest and freshly grated parmigiano-reggiano cheese. Drizzle some olive oil to finish. © Rika Manabe. All Rights Reserved. Simple theme. Powered by Blogger.